Gore Park Lofts is a new condo lofts project by Scholar Properties Ltd. & Effort Trust and is currently in pre-construction. Gore Park Lofts architect is designed by Thier + Curran Architects Inc. 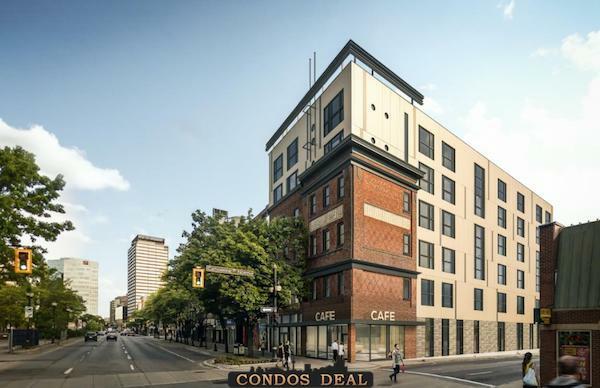 The new project will be located at 121-125 King Street East in Hamilton. The major intersection is King Street East & Catharine Street South. Gore Park Lofts will be 6 storey tower with 40 mixed units. Units will be a mix of one bedroom and two bedroom. Units will range from 553 sqft Up to 906 SqFt. Condo Lofts will have units starting from the $300s. The estimated completion date for Gore Park Lofts is set for July 2020.